Tie-in comics like this can always put you at a disadvantage from the get go, especially if they are based on famous events or some such. Or if they follow a certain lead-off point like this week’s brand-new Tomb Raider #1 does. 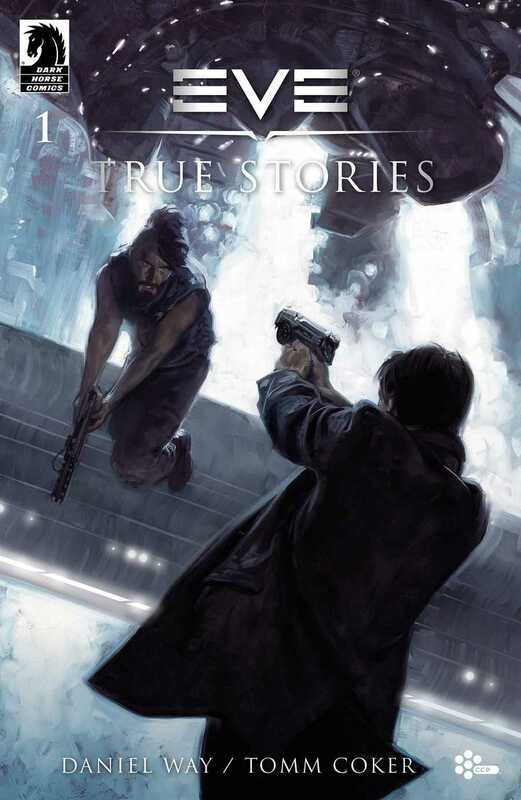 More than anything, that was my issue with EVE: True Stories #1, because I know absolutely nothing about the actual story of this MMORPG. I mean, I could look stuff up, but to the best of my knowledge EVE Online is an open sandbox game and not a typical MMO like, say, World of WarCraft is, with a specific overarching storyline for each game (expansion that is). But still, when all is said and done, this issue tells a really interesting tale of interstellar corporate machinations and space pirates, and how one reflects the other. On the one hand we have the Goonswarm corporation, a pirate group that preys on shipping across the galaxy and is quite successful at it. On the other hand we have the Black Nova Corporation, BNC, which is one of the victims of Goonswarm, especially since their shipping protection has been taking a big hit from Goonswarm’s operations. It all meshes together to create a mystery that excites the mind. But the execution feels off because there is so much going on in this comic. It is not as approachable a comic as I was expecting, far from it. For a newbie like me, it is a struggle to understand how all the different things are playing together with each other, particularly when we get an apparently big twist in the second half of the issue. Is it a reference to the real events that the comic is based on? Could be, but I can’t tell for sure. What I would have preferred is an issue that takes its time to develop the story, and the characters most of all. I want to know more about who these characters are, rather than being thrown right into the midst of everything and going on from there. However, the action is pretty top-notch, or close to it. It isn’t always clear just what is going on (an art problem), but I loved the fact that we got a good space battle right in the middle of the first issue, and this is doubly great because it reflects on the setting itself, from all that I’ve heard about it over the years. I love me some big space battles. On the art side, we have Tom Cooker on the pencils with Michael Atiyeh and Michael Heisler providing the colours and the letters respectively. And David Palumbo is doing the cover, which I’m not sure how it reflects on the story, but is decently cool regardless. Like I said, the art is a bit tough to follow, especially when the space action gets going, but I loved the grittiness of it. And the details, let’s not forget those either. Because this is an issue that is very detailed, especially in those (problematic) space battle scenes. Lots of ships going out at each other. Let’s see how the second issue pans out. I would love for it to be quite a bit better than this one, but this one wasn’t all that bad either. Just some minor things that need correcting, I think. Posted on February 28, 2014, in Comics Reviews, Review Central and tagged Action, Comics, Comics Review, Daniel Way, Dark Horse Comics, David Palumbo, Drama, EVE Online, EVE: True Stories, Michael Atiyeh, Michael Heisler, Review, Review Central, Science Fiction, Space Battles, Space Opera, Tom Cooker, Tomb Raider, Tomb Raider: Lara Croft, Video Games Tie-In. Bookmark the permalink. 7 Comments. I take it that you are a player? Used to be! My friend Row looks after my character these days (Adam Caine of course); played for about two and a bit years, hoping to get back to it when I eventually build my PC!